as usual, the display of the blocks, and at the end it did not turn out the way I expected to! emphasizing it by placing it in the large square center of each block, so that it is brought out. Although it is an evidence, I realize (late) that with Log Cabin pattern, and in general, if you want to emphasize the center block, you have to choose either a complete different color than the stripes, or a very strong value, dark or light. 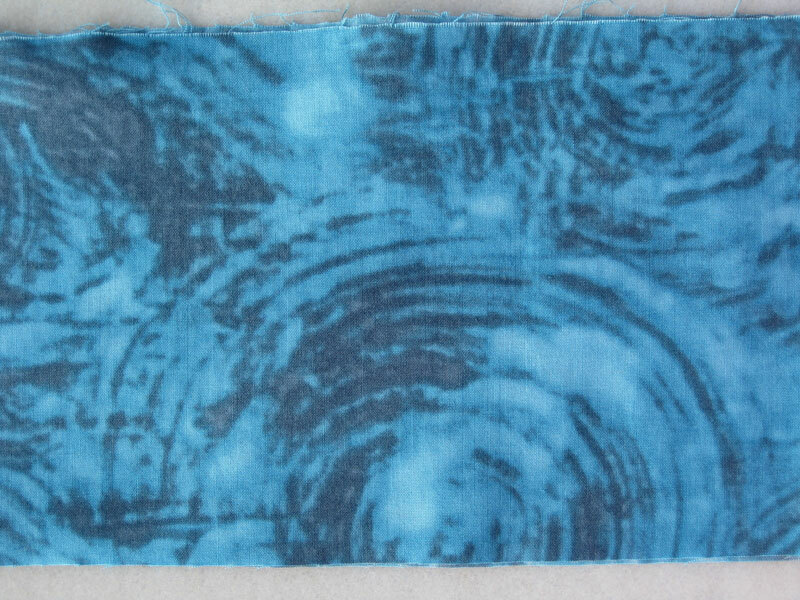 Here the value of this fabric was not contrasting enough with the blue strips. It would have made a striking contrast with the light turquoise fabric I used in the strips, which color is the one that is finally brought out. I must say that, though different than expected, I am rather satisfied with the final result. As regards the quilting, I am hesitating between a straight line design and a circular one. The advice of all my quilters friends would be very much appreciated. Your top is amazingly (is this a good englisch ...? ; 0)) beautiful!! Great top. I think circular design brings delicate look. It could be just perfect for the shape of central blue. Je ne peux pas le croire!!!! Tellement extraordinaire! Comment as-tu fait si vite? Je l'adore! Vite vite que je le ramène ici à Saint-Tropez! Oh Christine, this is beautiful! You made those blocks so quickly and they turned out beautifully. I'm sorry the centers didn't work like you had hoped but the end result is stunning no less. I look forward to seeing your quilting and the finish. Great job! It is just beautiful!! I have seen both straight line designs and circular designs on Log Cabins and they all look great. Personally I like circular designs on something that has a lot of straight lines or angles- the curves soften it somehow. No matter what you choose it will be a gorgeous quilt, no worries! Such a beautiful quilt! Wonderful colors! I like the circular idea for the quilting. I am sure whatever you decide will be lovely! 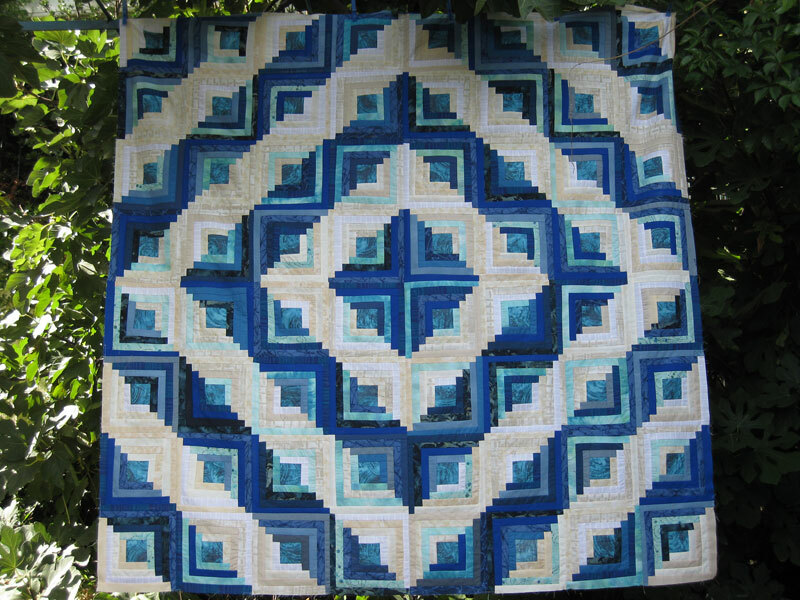 I like the use of that bit of ice blue in the cream colored portions of the quilt. The whole thing is lovely (and I'm a sucker for blue). It is gorgeous! I am a huge fan of all things blue, and this is just marvelous!!! It's a lovely quilt and I think your fabric choices have worked out just fine. I love circles, so that's how I vote! :) Lovely work! So pretty with the blue. I need to stop looking at log cabins as it's making me want to make more. This is just stunning...love it. Devine! And done in a week - impressive! Bonjour! So impressive you did this in just a week. I love Log Cabin quilts and your color choices are beautiful. It's always hard to decide how to quilt a top because there are just so many options. I too love log cabin quilts and think this top an excellent example! 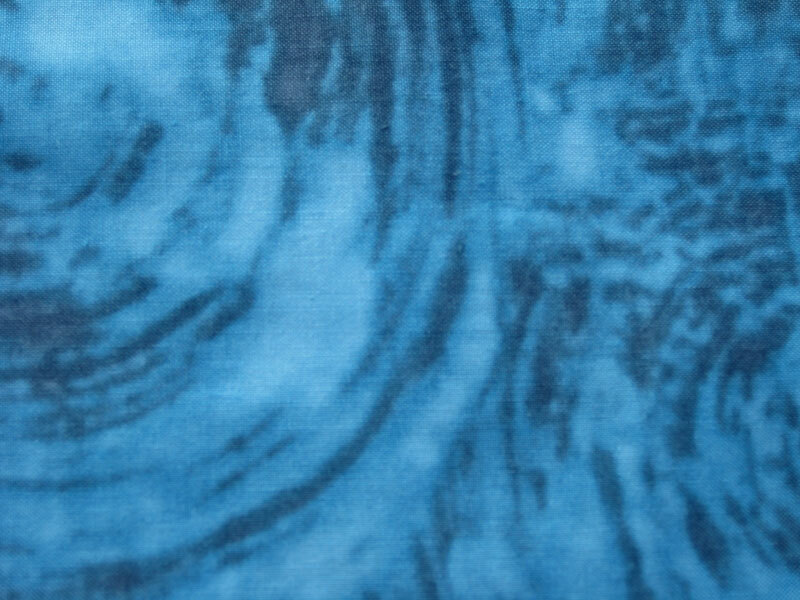 Your special fabric may not look like you wanted it to look, but it looks good! And it does get emphasis. Wow Christine! I am so impressed that you made this in only one week. It is a very beautiful log cabin! Your fabric choice is very good Christine! This stunning result is an answer about your questions about the center square : perfect choice. I have to take some more time to get to know all that you make, your blog is impressive! Merci, je suis touchee par tes compliments mais ne peux te repondre personnellement car tu es "noreply". Lovely quilt top! Blue and white always seem to work, don't they! I haven't made a log cabin in a while, but whenever I see a lovely one like yours, they start creeping back onto my "wanna make" list! It is so beautiful! I love all the fantastic blues. Oh, this is just beautiful! 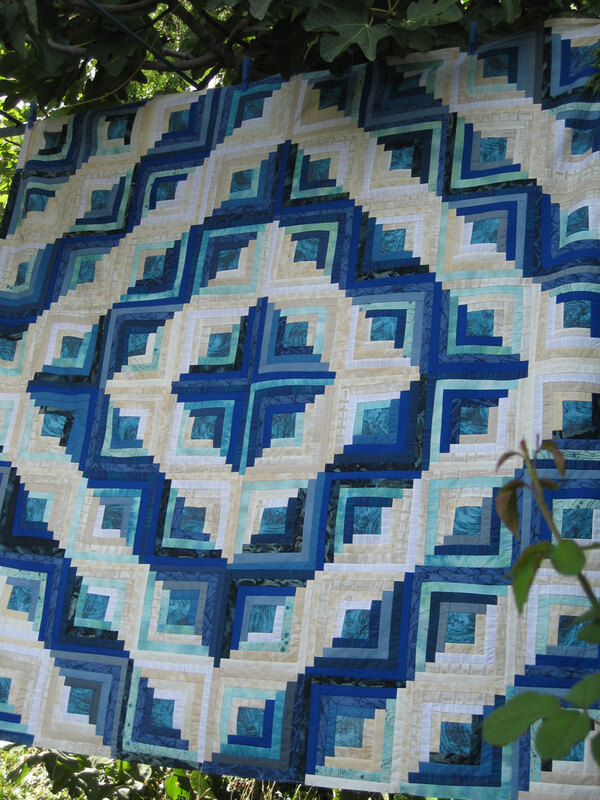 Blue is my favorite color, and it sings out so gorgeously in this quilt. A circular quilting pattern would not only contrast with the linear piecing, it would also repeat the design of your central block fabric. Wow! Log cabins are my favourite quilting block, and this is one of the most gorgeous log cabin quilts I've ever seen. Log cabins are so traditional and yet so stunning - always. Your is no exception. I love this! The watery blues remind me of the Mediterranean Sea. Just gorgeous! Christine your log cabin is very striking! I like it the way it is. Yes if you had put a red or yellow in the center that color would have popped out, but I really like that you used a variety of blues and whites/creams as if give it an overall great look. 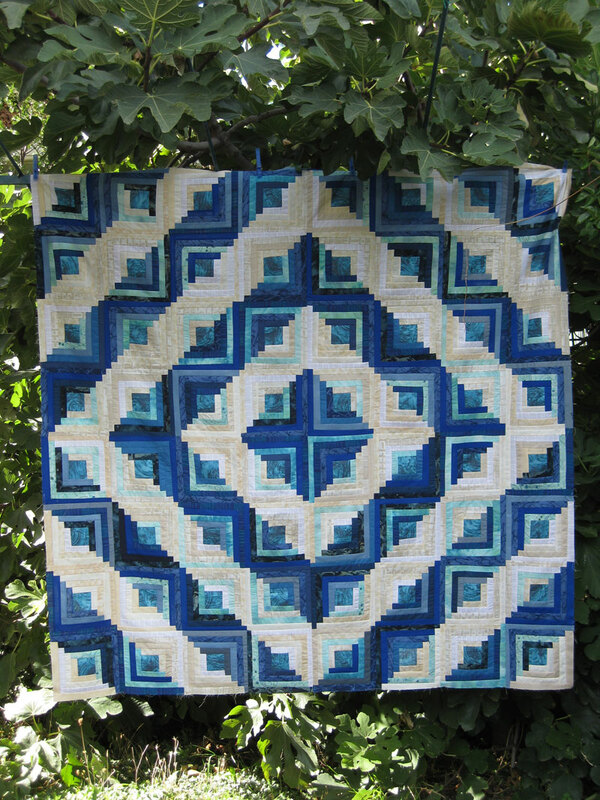 Whether you quilt it with straight lines or free motion it will look beautiful. If you don't want so many angles, since the log cabin is all rectangles and squares, you might choose the free motion for a softer look. If you quilt it with straight lines you will be echoing the lines of the logs and will make a stronger statement and look a bit bolder. So it all depends on the look you are trying to achieve because either way it's a gorgeous quilt! Amazing! The colors are luscious. Lovin' log cabin. I love log cabin quilts, and yours is really beautiful!